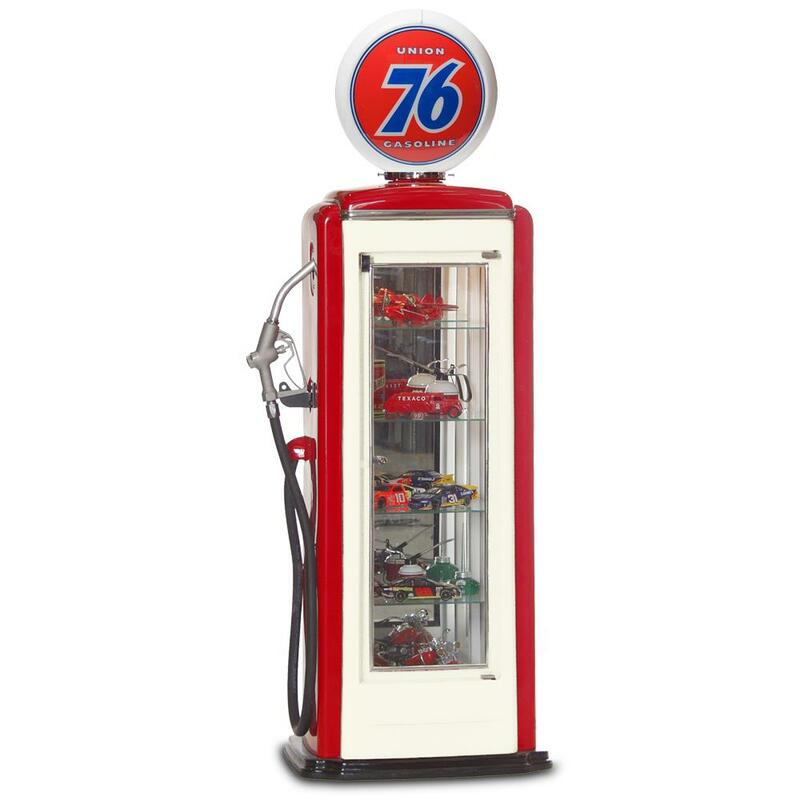 Show off your favorite collectibles in this impressive, full-scale 1950’s replica Union 76 gas pump display case. Case features high-gloss gel coated finish, locking glass door, right side glass panel, decorative gas nozzle with hose and illuminated globe assembly. Cabinet interior features full-length mirrors on the back and left side, four adjustable glass shelves, single smoke black acrylic bottom shelf, and overhead opera lighting. Features: Chrome package, stainless steel braided hose, left side glass panel in leiu of hose & nozzle.110 Volt. UL Listed. Roadside Relics began with a vision to recreate the world’s most recognized and sought after icons from the first half of the 20th century. In time, the line has expanded to include neon tire clocks, classic gas pumps and vintage soda coolers. Product development begins with extensive historical research, then searching through antique stores and auctions to find the right original piece. From that the design team painstakingly works over the details to create accurate models which will ensure authenticity of every Roadside Relics item. Once tooling is completed and accessories have been sourced, they're ready to make fiberglass parts. First, a hi-gloss gel coat is sprayed into the mold, backed with fiberglass cloth and resin. These materials bond to form a replicated part. Prior to assembly, each part goes through a thorough inspection for any finish imperfections. Next, each part is hand polished and buffed. Only then will parts be delivered to the assembly department. In the assembly department, skilled craftsmen professionally assemble each product. Items are available in a rainbow of colors and themes, so they rely on instructions from you, the customer, to build a truly unique piece. Before final packaging, each item is reviewed and inspected to ensure the highest standard of quality and satisfaction. Only then will the item be securely packaged for shipment to your home, office, or business. Today, Roadside Relics is one of the world’s leading manufacturers of replica memorabilia. The success is a result of superior quality and first rate customer service.